Hopefully you are not bored to read how passionate I am with literacy, either writing or reading. Beside writing and reading, I love traveling also. Let’s imagine…we can go to some place for not only 1-3 weeks, but for a month, two months, etc. While traveling we write about the journey and all those writing could be publish in the international magazines, traveling books, or website traveling, and a lot of international events would to invite us as a speaker. Huo…I am becoming so wild! 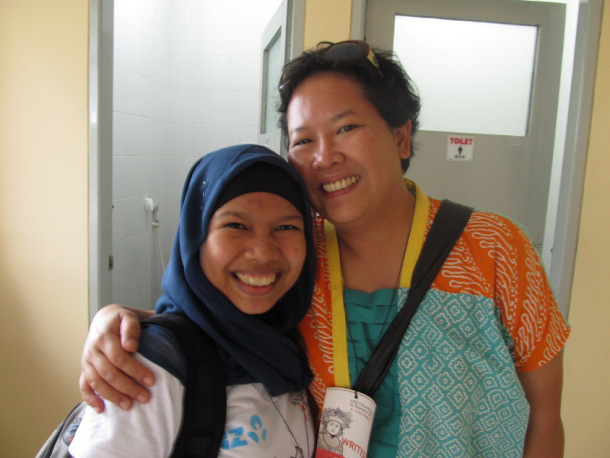 I met Trinity in Ubud Writer and Reader Festival 2011. Goodness, 4 years ago! And do you know when you have a dream, you need to share the idea to your friends or family so you have a support group to actualize that dream and I did it. I shared to my friends and thank God, they have the same dream with me. So, we made a concept to make our dream come true, step by step. Hopefully we can make some good progress every single day. I remember one quote from Mbak Ainun – founder of Akademi Berbagi: “Beri kaki pada mimpi – Give foot in a dream”. So whatever our dream if we want to make it, we should to start with one small step and start from now! Bonne chance! – Good luck! For all of you friends who participates in the challenge, please kindly fill out the below form below for your submission to ease and better result of recap process. The form will also available in other admins’ post (Bang Dani, Nita, Mas Andik, and Mas Ryan). You only need to fill the below form once. Thank you for your kind help and participation! Previous postKamu Payung, Jaket, Sweater, atau Jas Hujan? you’re on the way becoming it, arent you? Deva, I can see you becoming one!! That’s true, support network is important in achieving one’s dream. And I love the quote. Very encouraging. Thank you, Mbak Mikan. *hugs! mau ktemuu mba trinity jugaa. hahaha.. ga bosen yahh baca naked traveller. haha.. semoga kita bisa jadi international travel writer soon yahh! amin! hahaha. iyaa.. mangkanya mulai blog ini.. hopefully bs tetep konsisten nulis ttng travel. hehe..
Good luck on your dream dev, go wild!!! wah ternyata volunter saat UWRF dua tahun lalu ya Dev..
semoga impian bisa jadi travel writernya kesampaian ya. Really nice dream Deva. And i can see it in you. Ranselijo.com is one way to achieve it. Good luck to you mba. Will search about that, Dinar. Thanks.